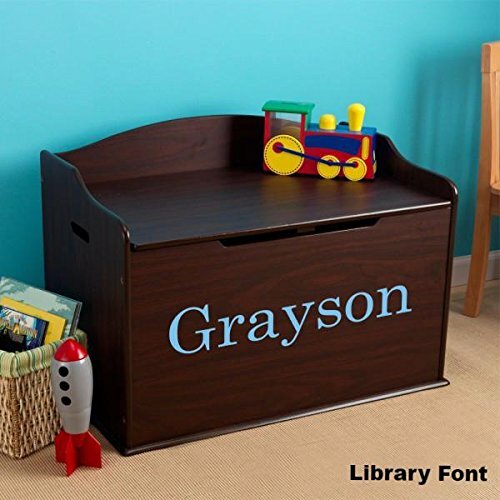 Keep books and toys off the floor with a Modern Touch Personalized Toy Box - Espresso. The toy box is not only beautiful, but sturdy as well and offers extra seating when needed. Personalize the toy box with your child's name in one of five bright colors. Beautiful and functional, it's the perfect birthday gift. * Personalized with your choice name. * Dimensions: 30.55" x 18.27" x 19.6"
* Safety hinge on lid protects young fingers from getting pinched. Suitable for ages 3+. * Materials: MDF. Assembly Required. Dimensions: 30.55" x 18.27" x 19.6". Assembly Required. Safety hinge on lid protects young fingers from getting pinched. Suitable for ages 3+.